The real scandal is the erosion of regulatory independence, which leaves the door open for fix-all solutions. Growing up as I did reading The Hindu’s sports pages, I was taken by the phrase “pyrrhic victory”. Clearly, the paper’s sports desk was too: it made the headlines an impressive number of times, usually to describe dead rubber Ranji matches. Since then, it has been among my unstated goals as a writer to ­deploy the phrase without sounding a cliché. This has been an unfulfilling enterprise in these minimalist times, where victories are hard to come by, let alone those laced with failure. Until now. Last week, when Seemanto Roy, scion of the Sahara Parivar, read out a message from his father Subrata describing his recent arrest as “the Best ­Honour My Country Could Give Me”, I knew I had my phrase. At the end of a long, and in the words of the Supreme Court, “outrageously ridiculous” cat-and-mouse game with Sahara, the Securities and Exchange Board of India (Sebi) has won a pyrrhic victory. Between 2009 — when it first sensed something fishy about Sahara’s fund-raising methods for its Prime City project — and now, Sebi has been thrown under the bus by the government and courts alike. Each time it emerged, bruised but relentless in its pursuit of wrongdoing by the group. When it finally managed to get Roy arrested, the Sahara chief simply turned the tables on the watchdog, suggesting he had surrendered ­“wilfully”, having been made a scapegoat despite his stellar contribution to the Indian economy. In its victorious battle to haul up a major conglomerate for twisting the law, Sebi had lost the plot. Sebi’s uphill struggle against Sahara underlines why it has been difficult for institutionalists to defend regulatory regimes from the usurpatory and activist tendencies of the “India Against Corruption” movement. Watchdogs statutorily designated to tackle malpractice have been unable to function effectively on account of political interference, not because they need a super-cop to assist them. It is inconceivable Roy would have had the gumption to pooh-pooh the most recent SC directive had he not been guaranteed political support. Indeed, Sahara built its entire case on the premise that it was the ministry of corporate affairs (MCA) and not Sebi that had jurisdiction over his unlisted companies. The government’s current top solicitor previously lent a veneer of legitimacy to Sahara’s claim, in response to a request fr­om the MCA. The law ministry endorsed this opinion. Even the SC, after its landmark ruling of August 2012 asking Sahara to refund Rs 24,000 crore to investors, slackened off, extending the deadline for payments. When Sebi’s lawyer argued that the same bench that asked Sahara to refund investors should also decide extensions, none other than the chief justice of In­­dia intervened, refusing to place the la­w­yer’s objection on record. The SC later witnessed the unprecedented spectacle of its Bar Association’s president asking the CJ, in open co­urt, to stay away from the Sahara ca­se. 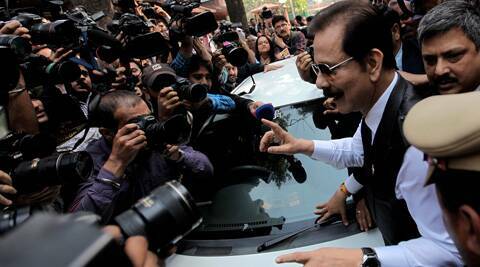 Sebi’s woes are hardly confined to its investigation of Sahara. Political response to the regulator’s request for greater powers — mainly to tackle ponzi schemes and illegal diversions of investor money — has been lukewarm. Legally speaking, Sebi has lived a hand-to-mouth existence, thanks to ­emergency laws. It was granted statutory powers in 1992 through a hastily conceived ­ordinance: Singapore-based scholar Shubankar Dam’s excellent new book on presidential legislation chronicles how even the chairman of Sebi then had no clue what the board’s new powers were, as the government hadn’t supplied a copy of the ordinance to him. As Dam notes, the finance ministry “retained both direct and supervisory” control over policies, leaving Sebi toothless. After the Satyam fraud was ­unearthed, many expected the UPA to come through on the Kania Committee’s recommendations to arm the regulator, only to be disappointed. Early last year, in the wake of the Saradha chit fund scam, the ­government rushed through an ordinance to enhance Sebi’s ­investigative powers. That ordinance had to be re-promulgated in September, and has now lapsed, because the Congress was unable to pass it during the monsoon and winter sessions of Parliament. Just as Sebi’s troubles don’t end with Sahara, regulatory concerns don’t end with Sebi. The board at least had an ordinance to help its work, albeit for a few months. The coal regulator recently created by the Union cabinet, on the other hand, has no statutory backing whatsoever. In its purely advisory role, the entity will frame “principles and methodology” around the fixing of coal prices. Pitched against the monopolistic hold of PSUs in the coal market, it needs no punditry to ­proclaim this regulator will be ineffective. It is at best a mediator between Coal India Limited and its buyers, not a dispute ­settlement body. Meanwhile, the original Coal Regulatory Authority Bill, 2013, we can safely assume, will gather dust. Some of the biggest controversies in this sector, such as diversion of coal from the Sasan Ultra Mega Power Project and the allegedly irregular allocation of captive coal mines from 2004 to 2009, have been on ­account of poor regulation, not discernible corrupt practices. Rather than curbing ­government discretion, this regulator would simply widen it because it answers to the Union cabinet. The investigative agencies assisting these regulators have fared no better. If the government had no qualms trying to ­influence the CBI’s status reports on coal ­allocation, its sincerity in setting up ­independent regulators is moot. To have its way in the appointment of a CBI ­additional director, the UPA rode roughshod over the recommendation and legitimacy of another watchdog, the Central Vigilance Commission. There is no surprise, then, that the IAC and the Aam Aadmi Party have tapped into popular demand for a “tough” watchdog. The Jan Lokpal wishes away the problems of regulatory and investigative agencies by insulating it from political interference, at least on paper. Its functional autonomy — thanks to a dangerous combination of investigative, prosecutorial and enforcement powers — may make it appear an effective agency. But as the recent controversy surrounding appointments to its selection panel highlights, even a Lokpal is not free from politicking. Unless the government’s inordinate discretion in their appointment and functioning is curbed, there can be no independent regulators in the truest sense. The Lokpal debate is merely a distraction. For now, Sebi may have scored a rare victory against Sahara — but at each stage of this dispute, its political masters chipped away at the board’s legitimacy, leaving it weakened for battles ahead.